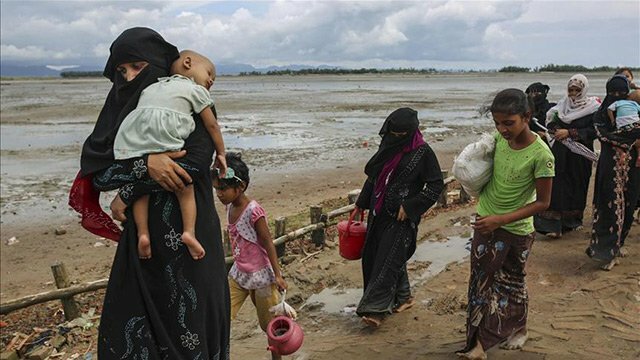 Crimes committed against Rohingya Muslims in Myanmar should be further investigated by a criminal tribunal, a human rights law firm said Monday. Washington-based Public International Law and Policy Group (PILPG), tasked by the U.S. State Department, after months of investigation released the report that said are reasonable grounds to believe crimes against humanity, genocide and war crimes have been committed against the minority Muslim group. PILPG gathered a team of 18 investigators from 11 countries and conducted more than 1,000 interviews of Rohingya in refugee camps, documenting "property and land confiscation, restricted access to food, marriage and family restrictions, religious persecution, extortion and threats of violence, forced labor, and regular beatings, rapes, and murder." The report called for a "politically viable choice to be made and the urgent establishment of an accountability mechanism or an immediate referral of the situation to the ICC," referring to the International Criminal Court. Investigators found that as Rohingya were fleeing to neighboring Bangladesh, Myanmar forces were gunning them down. "Military helicopters hunted for and fired upon groups of fleeing Rohingya, and the Myanmar Navy shot Rohingya with boat-mounted guns or intentionally rammed overcrowded ferries to drown those on board as they sought to flee across the Naf River into Bangladesh," the report said. The law firm's report had been used to create the State Department report released in September, however, the government fell short of calling the crimes "genocide" in Myanmar. If Washington were to use the term genocide to describe the atrocities, it could commit the U.S. to enforcing harsher measures against Myanmar. “The determination of genocide does have a cathartic effect for the victims. It conjures up a moral imperative among others to take more serious action,” the group said on Twitter. A UN report released in September called for the top Myanmar military officers to be investigated and prosecuted for genocide and crimes against humanity. It called for targeted sanctions on those most responsible and an arms embargo on Myanmar. "The international community is obliged to protect populations subjected to atrocity crimes by their own governments and ensure justice and accountability for such crimes," the report added. "The ultimate purpose of this duty is to provide justice to victims, deter potential perpetrators, and prevent future mass atrocities." In a report, the UNHCR refugee agency said nearly 170,000 people likely fled Myanmar in 2012 alone. Since Aug. 25, 2017, nearly 24,000 Rohingya have been killed by Myanmar’s state forces, according to the OIDA. The UN documented mass gang rapes, killings -- including of infants and young children -- brutal beatings, and disappearances committed by Myanmar state forces. In a report, UN investigators said such violations may have constituted crimes against humanity.